Thank you for your interest in one of Quality Auto Center's online offerings. Please continue for more information regarding this 2010 Chevrolet Express - 3500 155 LT - Adapta-van - Lowered Floor HIGH ROOF - Wheelchair ADA - CARFAX Certified 1 Owner - No Accidents - Fully Serviced - QUALITY CERTIFIED up to 10 Yrs / 100,000 Miles Warranty - LT with 52,414mi. This a worry-free vehicle that has passed our certification process. It's not often you find just the vehicle you are looking for AND with low mileage. This is your chance to take home a gently used and barely driven Chevrolet Express - 3500 155 LT - Adapta-van - Lowered Floor HIGH ROOF - Wheelchair ADA - CARFAX Certified 1 Owner - No Accidents - Fully Serviced - QUALITY CERTIFIED up to 10 Yrs / 100,000 Miles Warranty -. This is the one. Just what you've been looking for. 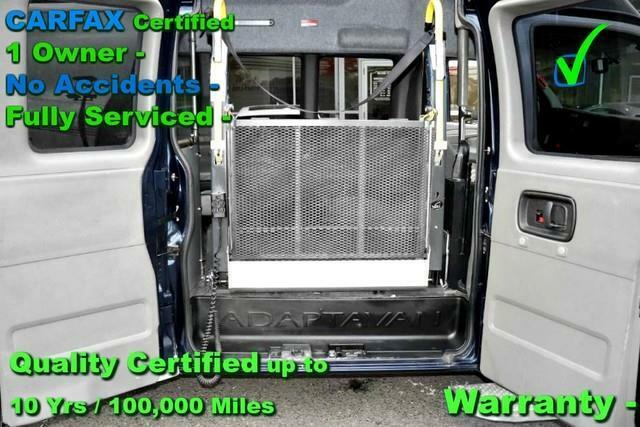 More information about the 2010 Chevrolet Express - 3500 155 LT - Adapta-van - Lowered Floor HIGH ROOF - Wheelchair ADA - CARFAX Certified 1 Owner - No Accidents - Fully Serviced - QUALITY CERTIFIED up to 10 Yrs / 100,000 Miles Warranty -: Sometimes, only a full-sized van will do. Whether you need to haul a dozen or more people or haul ten thousand pounds of equipment, the Chevy Express is one of the few vehicles that can accomplish it. In either passenger or cargo configuration, the Express can use E85 FlexFuel. Strengths of this model include configurable seating up to 15, massive cargo capacity, and Can be configured for work or families No Credit / Bad Credit / No Paystubs, No problem !! ! All Approved ! Everyone drives ! CLEAN, GORGEOUS, LOW MILES, SHOWROOM CONDITION. CALL NOW QUALITY CERTIFIED up to 10 YEARS 100,000 MILE WARRANTY , To Certify a vehicle, there will be an additional cost for Certification. CALL NOW For details. STUNNING AGGRESSIVE LOOK ON THIS BEAUTIFUL--Call today to schedule a test drive... Good Credit/Bad Credit/No problem!!!! Get paid cash? No problem!! 100% Credit Approval with interest rates starting at 2.49% for qualified customers, our rates will not be beaten. We price our cars at wholesale price to guarantee the best deals for our customers. Our inventory moves quick, please call to confirm the availability of the vehicle of your interest Springfield location 973-564-0112. This vehicle is located at our SPRINGFIELD location. Come visit our new showroom in Springfield NJ.